At Blue Impact Network, we look for political giving opportunities in states where you can leverage your donations for the greatest impact. While it's probably a little too early for anybody to be making strong predictions about "swing seats" in 2020, we can start by looking at the states where several key races intersect. 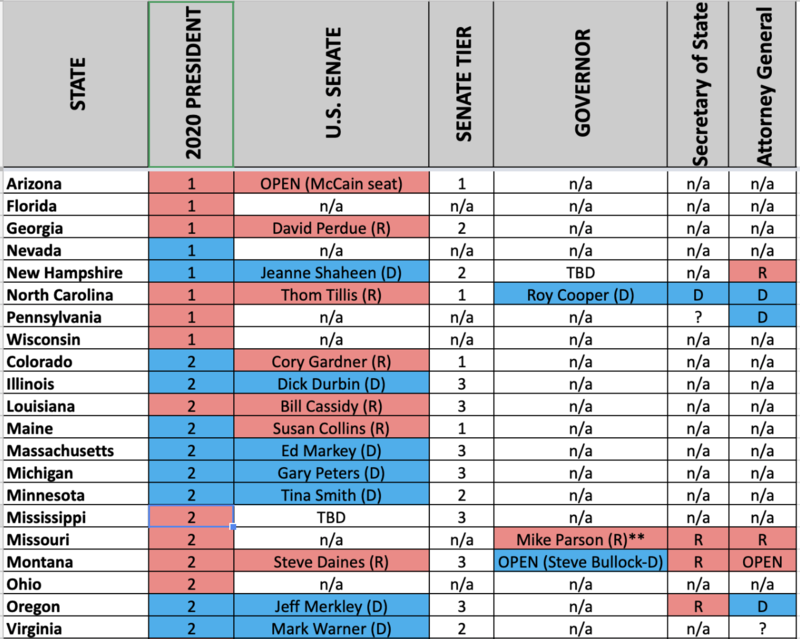 Take a loot at the chart we created at right, which is sorted by presumed swing state status for the 2020 Presidential Election ("1" is top tier). Arizona will likely be a critical state for winning the White House, and it also has a "Tier 1" U.S. Senate race in 2020. Investing in statewide organizations and campaigns in Arizona can benefit efforts to unseat President Trump and pick up a U.S. Senate seat that could allow Democrats to gain majority control in the upper chamber. The same opportunity might be available in Georgia, which is likely to be a top target for the Presidency and could become a swing seat for U.S. Senate depending on the eventual Democratic nominee. But the biggest bang for your buck may come in North Carolina (pictured above), which has "Tier 1" rankings for President and U.S. Senate that could be Democratic flips, and three statewide Democrats (including Governor) that need to be protected. Further down the list, Montana could be a wise investment with opportunities to flip 3 statewide races to Democrats (U.S. Senate, Secretary of State, and Attorney General), and an open race for Governor to hold a Democratic office. We'll continue looking for great political investment opportunities as more information becomes available and we have a better sense of potential candidates in top races. In the meantime, you can view the entire spreadsheet HERE, where you can sort categories by preference.